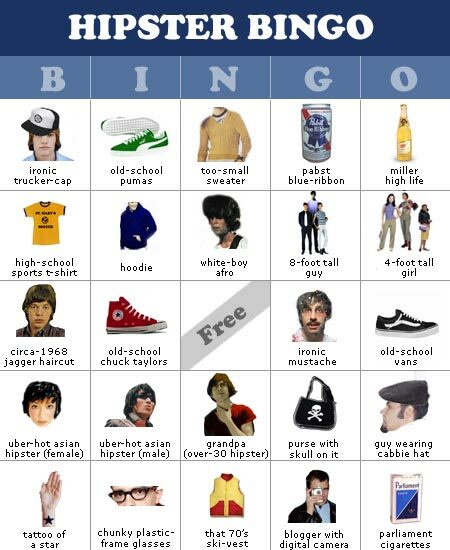 I have spent much time living as a participant observer (turned mostly observer) among the hipster populations in the urban and suburban metro area I have called home for the last 8 or so years. I’ve also spent a lot of time studying youth culture: what is it that floats Gen Y’s boat and what is the context that keeps their various pockets of culture and decision-trees above water? I’ve learned a good amount about the importance and nature of Irony over the course of said exploration. Especially when it comes to Millennials who grew up in a more suburban or middle class setting. You see, if you didn’t grow up with an abundance of hardship in a time (the 80s, 90’s and early 2000’s) when our American culture was not really creating much by way of original culture, there are two things that can happen to one’s sense of self and place in the world. Some sociological theory will tell us that if there isn’t a “fight” to champion that we will create one to give ourselves purpose. I think Gen Y chose the fight against a culture driven by consumerism and void of meaning – and did this by co-opting the absurdities of previous generation’s and current consumer culture in a way that kind of puts the joke on us as well as on them. And such the modern-day hipster was born. Instead of wearing black and hiding out in coffee houses writing poetry, this generation of middle class misfits decided to don various styles of garish and vintage attire and anti-status objects – especially with regard to transportation (bikes, scooters, beater cars) music (turntables, headphones as opposed to ear buds, vinyl, the 80’s) and fashion (band t shirts, trucker caps, desert-military scarves, high top sneakers) the 80’s) to create their own ironic value and subculture out of them. And the irony of the hipster existence is that they simultaneously make fun of pop culture’s past and present while voraciously consuming it. Can you say “lets go to Urban Outfitters”? But it seems that said hipsters are content in their ironic existence. But there are many in the same age-gap, if not just slightly older, who fall a bit to the “hater” side – feeling like this subculture is just a cop-out- a way of validating one’s perpetual adolescence by creating a “scene”. These critics would also say hipster is a hiding place for those who can’t stand the thought of living a sincere existence and examining the void they are filling with shallow self-expression. And I suppose there is the idea of actually creating something real rather than making fun of the absence of real and thus making fun of yourself in the process. But is criticizing ironic hipster culture ironic in and of itself? I would argue that there is indeed an intellectual rigor to hipster culture that, albeit exhausting and probably exerted more productively elsewhere, is still its own original thought and necessary commentary on the state of our American consumerism. In any case, I was particularly intrigued by last week’s article on “How To Live Without Irony” in the New York Times Sunday Review. The writer took the time to dig deep in dissecting the elements of hipster culture and confronting her own demons with regard to her intellectual perspective. “Throughout history, irony has served useful purposes, like providing a rhetorical outlet for unspoken societal tensions. But our contemporary ironic mode is somehow deeper; it has leaked from the realm of rhetoric into life itself. This ironic ethos can lead to a vacuity and vapidity of the individual and collective psyche. Historically, vacuums eventually have been filled by something — more often than not, a hazardous something. Fundamentalists are never ironists; dictators are never ironists; people who move things in the political landscape, regardless of the sides they choose, are never ironists. Next ›Gangnam Style In Context: A Global Phenomenon In Appreciation of Irony?